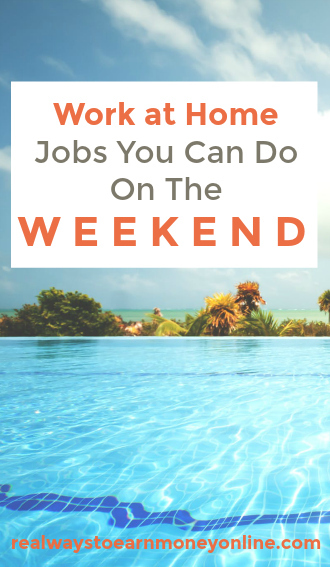 Want a Work at Home Job You Can Do On Weekends? Check Out These Ideas! Published January 30, 2018 By Leisa Good This post may contain affiliate links. Regardless, I only recommend sites I've researched and/or used and trust. Are you always on the lookout for ways to earn extra cash? Do you have a full-time job which uses up most of your time? Would you like to kick back and work at something totally different on the weekend? Well, keep reading. There are many work-at-home companies with no set schedule. These jobs give you the flexibility to earn extra money just on the weekends if you need more coming in than what your five days a week 9 to 5 brings. What Type Of Work Would You Like To Do On The Weekends To Earn Extra Cash? With many different types of work available and companies offering the work, there really should be something for everyone. To determine the type of work you may want to do, ask yourself what is your main goal in working weekends—other than just earning money? What skills can you bring to the table? What type of work environment are you seeking? In this article, we will explore this in more detail and then match what you are looking for to a skill and a company. Also, realize that a lot of these jobs have enough work that you could also work during the day or work at home in the evenings. However, if you need a “break-away” on weekends and a chance to start the day out doing something a little different, then weekends might be more ideal. Rover – (See Rover Review) – If you like taking care of dogs, you can set up shop here or through them, set up your own pet-sitting website. Rover will take 15% of your earnings, but you keep the rest as they do provide the insurance. Also, you are not limited to just dogs—goats, horses, turtles, lizards, and even pigs occasionally need a sitter. Fetch – On this site you may set up your own account and take care of both cats and dogs while giving snapshot updates to the owner. Also, this company takes more of a matchmaker role between the potential pet sitter and the pet. Whether you suffer from “cabin fever” or “cube fever”, a change of scenery can be welcome. There are plenty of opportunities to get out in your car and drive passengers around town or deliver food orders or other products to homes and businesses. If you just want to make delivery orders—and you have a valid driver's license and auto insurance —you have a weekend gig. In some cases you can even do your deliveries using public transportation, if that is all you have available. Lyft — earn by driving people around your local area, in your own car, and set your own schedule. You get paid for each trip on a per minute and mile basis. AmazonFlex – (See AmazonFlex Review) – For this company you will need not only your own vehicle, but the most recent Android phone and an Amazon account. You will be delivering orders for Amazon Prime Now. Amazon will assign you a mile radius to deliver to as well as which products you will be delivering. Postmates – (See Postmates Review) – You can deliver food or up to 20,000 other items. You don't need a vehicle for this one either, but you may find it faster and you can make more deliveries using your own car. Then don't do either! Hop on over—no pun intended—to TaskRabbit. Some folks have even converted their weekend gigs at TaskRabbit into full-time jobs. TaskRabbit – (See TaskRabbit Review) – This is something for those that want to do a variety of tasks and errands. The tasks can range from raking leaves to shoveling snow to reorganizing a garage. You can read the review and decide if the money and opportunity is there for you. If this is your philosophy, then why not go shopping—mystery shopping—that is! With these gigs you can sometimes earn extra cash, gift cards, rebates, and even free products. If you don't mind shopping or at least posing as a shopper and then giving an honest review of a business or establishment, this might be your weekend gig. Payments usually vary depending on what you are reviewing. Coyle Hospitality – This mystery shopping company has been around since 1996 and shoppers are allowed to “shop” and review stores, restaurants, hotels, spas, and cruises. Market Force – (See Market Force Review) – This mystery shopping site has a reputation for paying more than most other sites even though their site can be hard to navigate. Second To None – (See Second to None Review) – This site has been around since 1989 and is well known in the customer service industry. Well, then there are many opportunities to do office-type work, such as customer service, freelance writing, transcription or just miscellaneous tasks. Fancy Hands – (See Fancy Hands Review) – On this site you sign up and do the work of a virtual assistant. Tasks range from $3 to $50 depending upon the complexity. There are some “Fancies” that only work weekends and can still make a couple of hundred dollars. Note that this company currently has 1.9 stars on Glassdoor with most of the complaints being about the rate of pay being too low for what is expected of you. While this company is legit, we'd recommend reading the Glassdoor reviews first before applying. LiveOps – (See LiveOps Review) – If you like sales, this call center is open remotely 24/7, and there are agents who only work weekends and refer to themselves as “Weekend Marathoners”. Talk time plus commission is how they pay. Mturk – (See Mturk Review) – This site's formal name is Amazon Mechanical Turk, and it has a wide variety of short tasks that can be done and cashed out the next day. Surveys, transcription, short writing assignments, photo tagging, and many more tasks are available. Loyal fans of this site call themselves “Turkers”. Upwork – (See Upwork Review) – This site was the result of Elance and Odesk merging together several years ago. Any type of freelance work that you can think of would be on this site. You just need to set up an account and start bidding. There is no shortage of work-at-home jobs and ways to earn extra money even on the weekends. It really is just a matter of choosing the one that works best for you. Good luck! Check out this e-book with a list of 150 companies that regularly hire home-based workers. Get a membership to FlexJobs, the most trusted job board with flexible and remote work that is guaranteed to be scam-free. Get 50 percent off a membership with promo code LOVE. If that code is expired, use AFFILPROMO instead and you'll still get 30 percent off!